The 2018-19 offseason is now underway, and over the next several months the Yankees will look to improve their big league roster while sticking to some sort of budget. Every team has a budget. Some teams have bigger budgets than others, but every team has a budget. This past season the Yankees’ budget was the $197M luxury tax threshold, and they stuck to it. They stayed under the threshold. The luxury tax threshold jumps to $206M next year and the early indications are Hal Steinbrenner doesn’t want to exceed the threshold. “I don’t want to speak for (Hal Steinbrenner), but my general feeling from him and for us has been not wanting to line the pockets of others to let them utilize that excess against us,” said Brian Cashman recently, referring to the fact a portion of the money paid into luxury tax is distributed to other teams. Cashman indicated he can go to Hal to get approval to exceed the threshold, and I sure hope that is the case, because there are some great free agents out there this winter. Either way, that $206M number is an obstacle of some sorts, and my estimate says the Yankees have $49.7M to spend underneath the threshold. That’s a lot! Not enough for a truly massive free agent spending spree, but it is a lot. 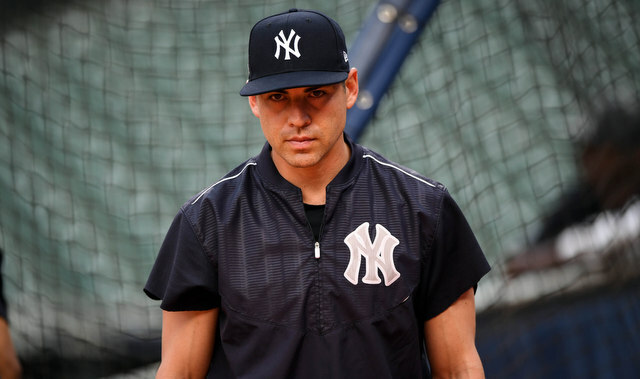 As the Yankees move through the winter they will have to navigate around Jacoby Ellsbury’s albatross contract. There are still two years and roughly $47M remaining on that deal, and Ellsbury missed the entire 2018 season with injuries. It’s unclear whether he’ll be healthy enough for Opening Day. This is also a guy who hit .261/.331/.372 (91 wRC+) in his last 1,500 plate appearances. Now he’s a 35-year-old speed guy coming off major hip surgery. Yuck. Trading Ellsbury for value is pretty much a pipe dream at this point. The best case scenario is trading him and saving some money, and, even then, the Yankees will have to kick in a sweeter. Remember the Chase Headley trade? 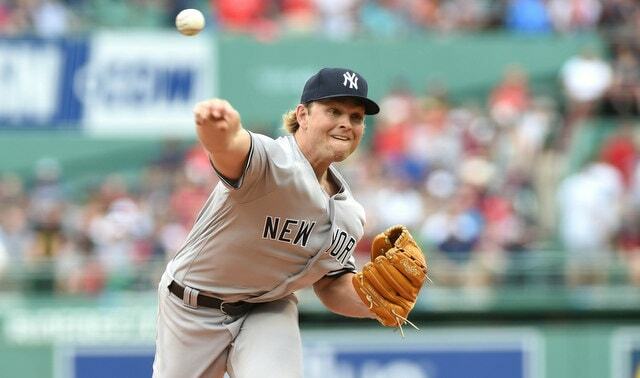 The Yankees attached Bryan Mitchell to Headley and saved $13M (!) against the luxury tax this year. Doing something similar with Ellsbury feels like it would take a minor miracle, at least something that leads to that much savings. No, it is not the most exciting trade in the world, but it doesn’t have to be exciting to be worthwhile. Long story short, the Yankees and Marlins would move some money around, which would improve the luxury tax situation in the Bronx and send a younger pitcher to Miami. Let’s break this down. 1. How does the math work? The Yankees and Marlins are concerned about very different numbers. The Yankees are worried more about the luxury tax hit than the actual salary. They care about the actual salary too, don’t get me wrong, but the luxury tax has been driving all their decisions recently. The Marlins, meanwhile, are focused on actual salary. They’re not close to the luxury tax threshold. Luxury tax hits mean nothing to them. A straight up trade would save the Yankees $5.86M against the luxury tax in 2019 and again in 2020 ($21.86M minus $16M). They wouldn’t save $13M like the Headley trade, but it’s something, and something is better than nothing. Ellsbury hasn’t played since last year and he’s just sitting on the roster, soaking up luxury tax payroll space. This at least clears some of that space. Of course, a straight one-for-one trade means the Marlins would absorb $5.28M in real salary spread across 2019-20 ($47.28M minus $42M). Would they do that? Not out of the kindness of their hearts. That’s where the out of options arm comes in. 2. Why would the Marlins do this? The Marlins have two options. One, they could keep Chen and pay him that $42M the next two years. Chen is 33 years old, he has a 4.75 ERA (4.38 FIP) over the last three seasons, and he’s missed a bunch of time with lingering elbow trouble. He has no long-term value to a rebuilding team like Miami. He’s an innings guy they hope will stay healthy and pitch well enough to create some trade value, which is unlikely. That rarely happens. Marlins eat all $5.28M and get German. Marlins eat half the $5.28M and get Cessa. Marlins eat none of the $5.28M and get Cole. The more money Miami eats, the better the pitcher they get in return. (Who the Marlins consider the best pitcher may not be who I consider the best pitcher, obviously.) If they eat the $5.28M difference in salary, they get a the best young pitcher in German and the Yankees get Chen with a $16M luxury tax hit. If the Yankees have to eat the entire $5.28M, the Marlins get the worst out of options arm in Cole and the Yankees get Chen with an $18.64M luxury tax hit — that’s the $5.28M cut in half and added to the $16M in 2019 and 2020 — which is still $3.22M in luxury tax savings in 2019 and 2020. 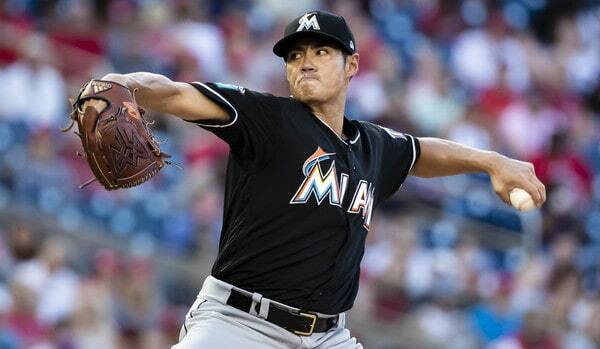 So it boils down to this: The Marlins can either keep Chen, who has no value to them, or make the trade and get a young enough arm who might help long-term. They’re buying a young arm, basically. Keep in mind Marlins executive Gary Denbo was the Yankees’ farm system head from 2014-17. He presumably has some insight into German and Cessa, which could help push things along. The $40-something-million is a sunk cost. The Marlins have to pay it to someone no matter that. They can either pay it to Ellsbury and get a younger pitcher in the process, or pay it to Chen. 3. Why would the Yankees do this? For the luxury tax savings, obviously. The worst case scenario here is eating the $5.28M difference in salaries and giving up a spare out of options arm in Cole, who is probably not going to stick on the roster all offseason anyway, and saving $3.22M against the luxury tax payroll. The best case scenario is the shedding the full $5.28M difference in salaries and giving up a spare out of options arm in German, who also might not stick on the roster all offseason, and saving $5.86M against the luxury tax. Worthwhile either way. 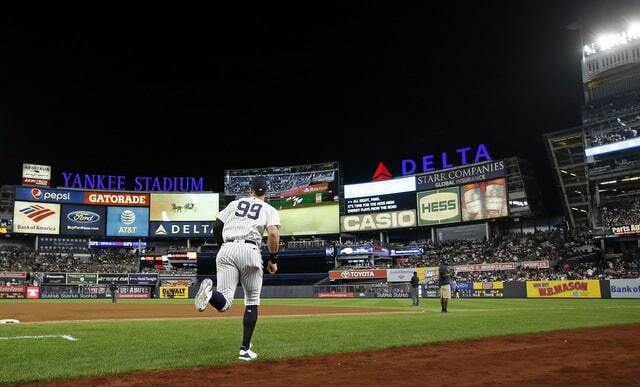 What do the Yankees do with Chen? Beats me. They could simply release him. I’d recommend taking Chen into Spring Training and seeing whether he can help in some capacity, even as a mop-up guy, then making a decision at the end of camp. Again, the $40-something-million is a sunk cost. The Yankees have to pay it no matter what, and, right now, they’re paying it to Ellsbury to do nothing. Maybe they can instead pay it to Chen to soak up low-leverage innings. The primary objective here is the luxury tax savings. Anything Chen gives them is a bonus. 4. Why would Ellsbury agree to this? Ellsbury’s contract includes a full no-trade clause. Even if it didn’t, he’s been with the Yankees long enough now to pick up five-and-ten rights, which is kinda crazy. Why would Ellsbury go to the Marlins? There is only one good reason: Because they’ll release him. That’s the condition of the trade. The Marlins have to release Ellsbury immediately after the deal. It sounds crazy, I know, but it is not unprecedented. Remember the big Dodgers-Braves salary shuffle deal that sent Matt Kemp back to Los Angeles last offseason? Adrian Gonzalez was in that trade and Atlanta had to release him as the condition to get him to waive his no-trade clause. Gonzalez got to keep every penny in his contract and pick his next team, who he could sign with at the pro-rated minimum. Once the Marlins release Ellsbury, he’d still get every penny, he’d get to pick his next team, and it wouldn’t cost anyone anything substantial to sign him. For Ellsbury, that would presumably be preferable to sticking with the Yankees, who don’t seem to have a place for him. 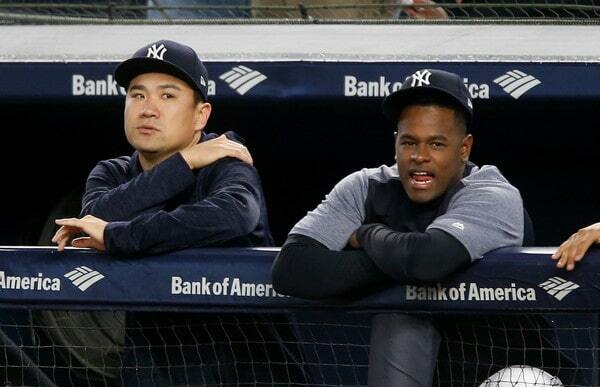 Over the next two years the Marlins owe Chen $42M and the Yankees owe Ellsbury $47.28M. There’s no getting out of that money. So, to make the best of a bad situation, the two teams could swap those contracts and figure out what to do with the $5.28M difference. Shouldn’t be hard. The Yankees would get a lower luxury tax hit and the Marlins would add a pitcher in his mid-20s with a chance to help long-term. And if he doesn’t, so be it. But at least they get to try. A win-win? Well, I wouldn’t go that far. This is more like two teams making the best of a bad situation. They’re both stuck paying an unproductive veteran $40-something-million in real dollars the next two years. The Yankees and Marlins can either stick with their current situation, or work with each other to make things a little more palatable. To me, it seems better than staying with the status quo. The Yankees were one stupid base hit with the bases loaded away from going for the sweep today. Instead, after yesterday’s loss, they’re looking to win the series today so they can avoid losing back-to-back series to bad teams. The Yankees are 1-3-1 in their last five series while only playing two good teams (Athletics and Mariners). Gross. It is a spectacular day in New York. Hope you brought your sunglasses to the ballpark. First pitch is scheduled for 1:05pm ET and YES will have the broadcast. Enjoy the ballgame. Injury Update: Aaron Judge (wrist) took batting practice and hit against a high-velocity pitching machine today. He is “getting real close” to returning as a hitter and could be a full player at some point during the Red Sox series that begins Tuesday. Hard-throwing righty Nathan Eovaldi is scheduled to start Tuesday. Returning against lefty David Price on Wednesday or lefty Eduardo Rodriguez on Thursday seems more likely, in my opinion. 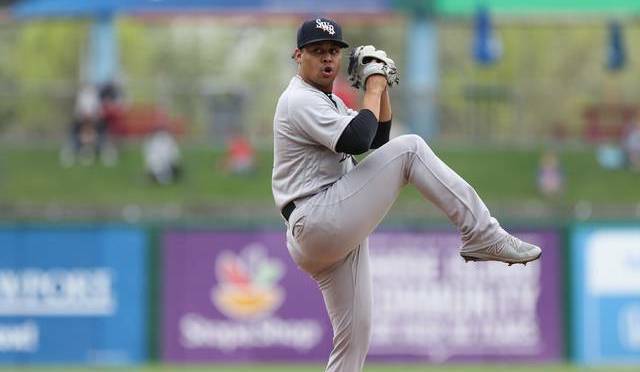 Roster Note: Justus Sheffield and Domingo German will join the Yankees on Tuesday. (Tomorrow’s an off-day.) Both pitched yesterday and will be unavailable for a few days anyway, plus it gives them a little breather after the Triple-A postseason and a chance to collect their things. RHP Erik Swanson was removed from the Triple-A postseason roster and placed on the disabled list with a groin injury, reports DJ Eberle. RHP Domingo German takes his place. German is still working his way back from a nerve issue and was MIA for a bit after High-A Tampa’s season ended last weekend. Now he’s with the RailRiders. SS Kyle Holder has moved up from Trenton to Scranton, according to Conor Foley. I had a feeling that was coming. Said so last night. Holder has not been added to the active roster yet. He’s with the team in more of an emergency capacity right now. 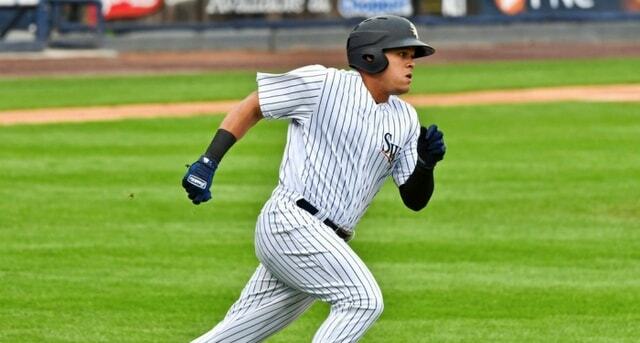 The season is over for the Double-A Trenton Thunder, the High-A Tampa Tarpons, the Low-A Charleston RiverDogs, the Short Season Staten Island Yankees, the Rookie Pulaski Yankees, and the two Rookie GCL Yankees affiliates. Trenton was swept in their best-of-five first round postseason series. None of the other teams affiliates qualified for the postseason. In one week and two days all 30 MLB teams will be able to expand their active roster from 25 players to 40 players. Most teams wind up carrying 30-35 players in September. September call-ups have become somewhat controversial but I am 100% for them. I explained why a few years ago. It seems likely the rules will change at some point in the future. Right now, the rules are what they are, and teams can have 40 active players on their roster as of next Saturday. In recent years the Yankees have been a very aggressive September call-up team. They tend to call up lots of players and they call them up early. Some teams only add a third catcher and an extra reliever on September 1st. Not the Yankees. They go all out. Last year they called up five players on September 1st. The year before it was seven players on September 1st. The year before that? Eight players on September 1st. I expect lots of September 1st call-ups again. So, with that in mind, let’s take a moment to sort through the team’s September call-up options and figure out where each player fits, if at all. Some call-ups are kept around for emergencies only. Spare long relievers and a third catcher, guys like that. Others are brought up for a specific reason or to fill a specific role. Let’s get to it. Might as well start here. The Yankees have lots of players on the disabled list right now and sometimes, rather conveniently, players will get healthy on September 1st. That happened with Matt Holliday last year. He was on the disabled list with a back issue and was activated on the first day rosters expanded. Funny how that works. 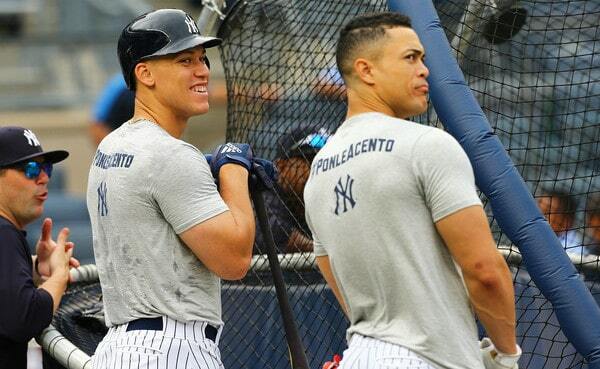 Aaron Judge (wrist) and Clint Frazier (post-concussion migraines) are both making progress but it seems very unlikely either will be ready to return next Saturday. Gary Sanchez, however, will begin a minor league rehab assignment either today or tomorrow. He’s going to play a few games in the rookie Gulf Coast League before joining Triple-A Scranton for what Aaron Boone called a “week’s worth of games.” Sure seems like Gary will return on September 1st. Didi Gregorius is eligible to be activated next Thursday and it’s unclear right now whether he’ll be ready to be activated that day. 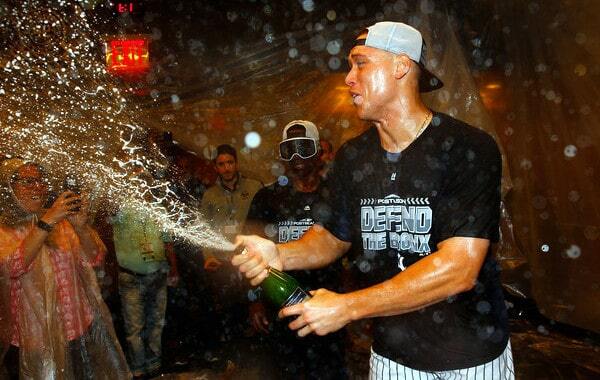 The Yankees said they have to see how his heel responds the next few days before knowing when he’ll return. If Gregorius is ready to go Thursday, would the Yankees give him the proverbial two extra days and wait until Saturday to activate him? I don’t think so, but you never know. It would be quite easy to give Didi those two extra days to make sure he’s 100% ready to go. Aroldis Chapman landed on the disabled list yesterday and he isn’t even eligible to be activated until next Saturday, so even if he comes back after the minimum ten days, he’ll return with expanded rosters. That makes life easy. Whenever Chapman is healthy, the Yankees will activate him and add him to the roster. They won’t have to send someone else down to accommodate him. Okay, let’s get to the minor leaguers. Generally speaking, the first wave of September call-ups — those are the September 1st guys — are players who have been going up and down all year. Many of them are already in the big leagues because of the injuries though. Tommy Kahnle, Ronald Torreyes, Luke Voit … they’re with the Yankees now. If I’d written this post a week ago, those three would’ve been identified as September 1st call-ups. There are two up-and-down guys in Triple-A right now: Tyler Wade and Luis Cessa. I expect both to come up on September 1st. Wade to give the Yankees another bench player (a four-man bench? madness!) and Cessa to be another long man and occasional spot starter. The only thing with Cessa is that he might come up as the 26th man for Saturday’s doubleheader game in Baltimore. If he does, he has to go back down after the game, then he’ll have to wait ten days to be called back up. The ten-day rules means Cessa won’t be eligible to be called back up until September 4th. Point is, as soon as he’s eligible, I think Cessa comes up. At the moment the Yankees have five healthy players on the 40-man roster and in the minors: Cessa, Wade, Albert Abreu, Ryan Bollinger, and Chris Rabago. I am fairly certain Chance Adams will be sent down tomorrow when CC Sabathia is activated — Adams threw 46 ineffective pitches last night and I don’t see the Yankees keeping him around when Sabathia returns — so it’s really six healthy players on the 40-man and in the minors. Abreu is a Single-A pitcher who’s thrown 62.2 innings around injuries this year. There is no reason to call him up in September only to have him sit in the bullpen as the 38th or 39th or 40th guy on the roster. Abreu needs to pitch. He needs to spend September in Instructional League in Tampa. That’s the best thing for his development. Rabago was claimed on waivers yesterday and is a light-hitting Double-A catcher. He’s not a call-up candidate. He’s a guy who gets dropped from the 40-man roster when a spot is needed. Bollinger has had two one-day stints with the Yankees as an emergency arm this year and I don’t think he’s getting a September call-up. He is much more likely to be dropped from the 40-man roster to clear a spot for someone else. Bollinger is not even in Triple-A. He’s a 27-year-old journeyman with a 4.03 ERA (3.42 FIP) in 91.2 Double-A innings. Those two call-ups were “we need a warm body” call-ups, not “we like this guy” call-ups. Sorry, Ryan. As for Adams, assuming he is sent down for Sabathia, he will be back in September for sure. I wouldn’t be surprised to see the Yankees leave him in Triple-A until Scranton’s season is over though. They might not make the postseason, so it might be over soon, but if they do make the postseason, Adams could be part of the rotation. Remember, when the Yankees called Adams up for that spot start a few weeks ago, it was only because Cessa was unavailable. Letting Adams pitch in Triple-A through the end of their season seems like the way to go. The Yankees have three injured minor league pitchers on the 40-man roster right now: Domingo Acevedo, Domingo German, and Jonathan Loaisiga. All three recently started pitching in rehab games but might not be ready to come up on September 1st. I think German comes up right away, as soon as he’s deemed fit for MLB. Acevedo and Loaisiga need innings and I expect both to stay with Double-A Trenton through the postseason. (Trenton is definitely going to the postseason.) German comes up as soon as he’s healthy. Acevedo and Loaisiga are probably going to have to wait. The shift to the bullpen earlier this week all but confirmed Justus Sheffield will be called up in September. The Yankees say they are going to give him 3-4 relief appearances in Triple-A — that suggests he could be a September 1st call-up — to prepare him for bullpen work in the big leagues. A September call-up has felt inevitable for weeks now. Now we know it’ll happen, and we know Sheffield will work out of the bullpen. Sheffield is getting called up in September. Stephen Tarpley might as well. Brian Cashman mentioned the southpaw by name last week when discussing call-up candidates. Tarpley has been excellent this year — his 71.0% ground ball rate leads affiliated baseball — and he’ll almost certainly be added to the 40-man roster after the season to avoid Rule 5 Draft exposure. I think he’ll get added to the 40-man in September and called up. Will he pitch? Probably in mop-up duty only, and that’s fine. Countless relievers broke in as September mop-up guys. There are three other non-40-man players who I think I have a chance to be called up in September: George Kontos, Erik Swanson, and Gio Urshela. I don’t see guys like Mike Ford or Ryan McBroom or Abi Avelino getting called up. Avelino is the only real prospect of the bunch and he’s a fringe guy who might not get a 40-man spot after the season. Injuries could always force a call-up. I just don’t see the Yankees creating 40-man space to call those guys up though. My hunch is George Kontos will be a September 1st call-up guy. I thought it was pretty weird a guy with his track record and service time accepted an outright assignment to Triple-A when he was designated for assignment last week. Usually a guy in his spot elects free agency and finds a team with a better shot at MLB playing time. Seems like their might’ve been an “accept the outright, go to Triple-A for two weeks, and we’ll call you up on September 1st” conversation at some point. Urshela is an interesting case. The Yankees got him in a cash trade earlier this month and he’s played well with Triple-A Scranton, hitting .310/.333/.483 in 16 games. He’s a fantastic gloveman who would be a great defensive replacement for Miguel Andujar. How many infielders do the Yankees want to carry though? They’ll already have Wade and Ronald Torreyes on the September bench, plus Neil Walker could always play the infield as well. The x-factor here might be whether the Yankees want to keep Urshela for next year. Add him to the 40-man, play him in September, keep him over the winter, then bring him to camp next year? Hmmm. Swanson? I think he’ll fall victim to the numbers crunch. Cashman did mention him by name along with Tarpley last week, but Swanson has already thrown a career high 109.1 innings this year, and the Yankees are already set to carry several spare September long men (Cessa, German, eventually Loaisiga). Do they need another one? Do they want to clear a 40-man spot to carry another one? I don’t think so. Either way, Swanson figures to stay in Triple-A through the postseason before being called up, if he is called up at all. As for 40-man space, the Yankees are full after claiming Rabago yesterday. Both he and Bollinger can easily be dropped to open space though. Is Clint Frazier a 60-day DL candidate at this point? The Yankees could call up the injured Thairo Estrada and put him on the 60-day DL to clear another spot. That means giving Thairo a month of big league pay and service time, but that’s not a huge deal. They’ve done it before. Looks to me the Yankees have three easily available 40-man spots (Sheffield, Tarpley, Kontos? ), and possibly a fourth if Frazier is indeed a 60-day DL guy. What About A Designated Pinch-Runner? Contending teams will often call up a crazy fast guy specifically to pinch-run and sometimes that guy winds up on the postseason roster too. Two years ago the Yankees made a minor trade for Eric Young Jr. to be their designated pinch-runner. Remember Rico Noel in 2015? Heck, Freddy Guzman was on the 2009 postseason roster as the pinch-runner. He pinch-ran twice in the team’s 15 postseason games. Last year the Yankees did not acquire a designated pinch-runner. Why? Because they had Jacoby Ellsbury on the bench, and also Wade, who is fast as hell. Shane Robinson can also run. I don’t think the Yankees will trade for a Young or Noel or Guzman type this year, even with Ellsbury injured. I think they’ll use Wade as their primary pinch-runner with Robinson the secondary option. Never say never. Trading for a dude to pinch-run just seems so unlikely this year. What About The Luxury Tax? September call-ups of course count against the luxury tax payroll. Every player on the active roster or big league disabled list counts. Based on my last estimate, the Yankees have about $3.3M in wiggle room under the $197M luxury tax threshold. That number is probably closer to $2.8M or $2.9M now because the Yankees have had to call up injury replacements the last few weeks, but still, that’s plenty. Just consider the “worst” case September call-up scenario. Say the Yankees call up the maximum 15 players on September 1st and they’re all making $600,000 at the MLB level. That is $3,225.81 per day per player. Call it $3,300 to make the math easy. Fifteen players times 30 days in September (the season ends September 30th) times $3,300 per day equals $1.485M added to the luxury tax payroll. That fits within the team’s available payroll, and remember, this is a very conservative example. Fifteen players making $600,000? Not happening. The luxury tax won’t be an issue for September call-ups. Now that I think about it, I don’t expect Acevedo to get a September call-up. He did spend one day in the big leagues earlier this year, but that was an emergency situation. Injuries have limited Acevedo 63.2 innings this season — he threw a career high 133 innings last year — and the Yankees may rather send him to Instructional League so he can actually pitch. Acevedo would be what, the 15th option out of the bullpen in September? Yeah, I think he gets a call-up. Not including the injured big leaguers, that is eight players added to the roster in September. Judge and hopefully Frazier will be activated at some point as well. So that’s eight minor league call-ups (Adams, Cessa, German, Kontos, Loaisiga, Sheffield, Tarpley, Wade) and five injury activations (Chapman, Frazier, Gregorius, Judge, Sanchez), giving the team 13 additional players in September and a 38-man roster. Urshela is the wildcard here, moreso than Swanson. I don’t expect the Yankees to open up a 40-man spot to carry yet another pitcher in September. (Another pitcher who doesn’t figure to pitch much.) Urshela would be a high-end defensive caddy for Andujar and another warm body for mass substitutions in blowouts. The Yankees will need 40-man spots for Kontos, Sheffield, and Tarpley. If they open another one, I think it goes to Urshela. Another pitcher is overkill, even in September. RHP Domingo German, who left yesterday’s start with a biceps issue, has been placed on the Triple-A disabled list, the team announced. RailRiders manager Bobby Mitchell told Conor Foley that German has been diagnosed with ulnaritis (nerve irritation, basically) and will be shut down ten days. He could return to the mound soon after that. Good news, all things considering.